Solar Cookers – What are they? 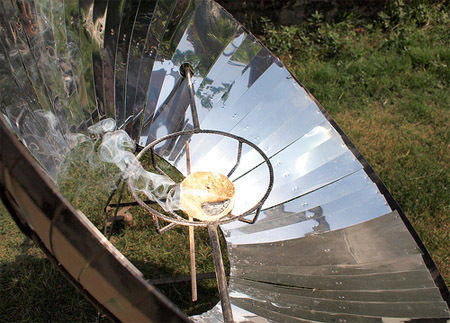 A solar cooker is basically an oven powered by solar energy instead of gas or electricity. Solar cookers are used to cook food, heat water or sterilize usually by concentrating the sun’s energy with reflective surfaces. Advanced versions of solar cookers use solar cells to convert the sunlight into electricity. This electricity is then used like a traditional electric oven. However, most solar cookers are simple devices that use the sunlight for cooking and heating food and water. It is essentially meant for outdoor cooking and in situations where there’s a scarcity of cooking fuel (often in less-developed countries where animal dung or wood is used). Solar cookers use basic principles of harnessing the sun’s energy, and different cookers use slight variations on the theme. Some cookers focus on concentrating the sun’s light and heat. This type uses a set of reflective mirrors that–like a magnifying glass–concentrate solar energy onto a small area of cooking. Some solar cookers use heat energy more effectively since heat can be lost easily through convection when the solar cooker is kept exposed to open air. In order to trap the heat energy, a covering can be used over the cooking area to keep the air heated at all times–creating a solar oven. Minimizing reflection of light is also important for trapping solar energy. This heat helps to cook either by direct application or indirect heating of the vessel. Solar cookers can be used anywhere with uninterrupted bright sunshine. Countries with moderate to hot summers can use solar cookers effectively. Almost all states of USA use solar cookers along with many African countries, India, China and Russia during summers. Lack of fuel gas or electricity can be easily overcome by using solar cookers. Build Your Own Solar Cooker! It is entirely possible to build your solar cooker at less than $5. See plans for building your own solar cookers here.